Budget Barbie: My Coffee Mug Only Looks Paper - it's Really An ECO Mug and is Reuseable! 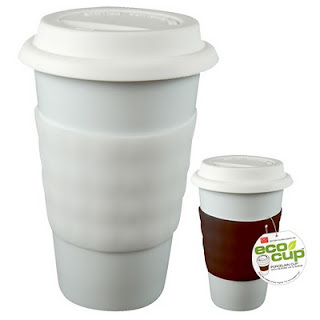 My Coffee Mug Only Looks Paper - it's Really An ECO Mug and is Reuseable! Coffee is morning is a Caribou Coffee blend in a tall - ECO Cup it looks like a paper cup from your favorite coffee shop but it's not! I've mentioned my coffee mug in passing previously because my daughter got it for me for Mother's Day. I had showed her one similar a few months ago at a gift shop in an art museum gift shop. They wanted $20 for it, so needless to say I never 'got around' to buying it because I never had an extra 20 bucks to spend on myself. Fast forward. My 19 year old ordered me one off the internet and gave it to me as a Mother's Day gift. I got it on a Sunday and took it to work with me on Monday morning. While at a staff meeting my Director (sitting to my right) kept looking at my coffee mug instead of concentrating on the meeting. Finally he reached over and started to touch the brown 'paper sleeve' around it. He interrupted the meeting to ask me about my coffee mug. My "paper" coffee travel cup was actually an Eco Cup - it looks like a paper mug you get in the drive thru and toss into the trash/landfill but it's not! One of my coworkers makes comments about any of us who bring a paper or Styrofoam cup into work so I was hoping she was paying attention when I explained it only LOOKED like a paper coffee cup - it was really ceramic and environment friendly! My version is single-walled (non-thermal) porcelain cup with silicone lid and sleeve. Holds approximately 16oz with a brown sleeve. It's microwave and dishwasher safe. But a quick check of Amazon this morning showed me there were a number of choices available. Check it out if you're looking for a fun Father's Day gift or even a gift for the coffee-loving graduate for the long study-nights at college!